Emmanuel Press has been producing Christmas cards since 2011, debuting new designs almost every year. 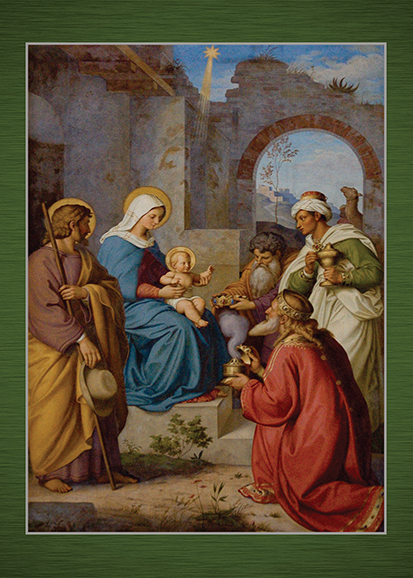 Even in this age of electronic communication, our sales of Christmas cards grow with each year as our customers send greetings of Christ’s birth to their family and friends. This increase means that we can print in higher volume, which lowers the printing prices – and we are pleased to pass this savings on to you! Visit our Christmas cards page to create a custom assortment from our 10 exclusive designs, now saving 10%. As always, please contact us if you’d like to order a specific number of cards, place a bulk order, or request imprinting for larger orders (additional fee applies). 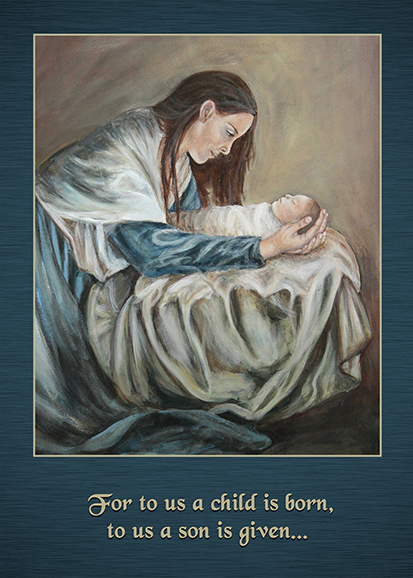 This year we are pleased to feature an acrylic painting by artist and graphic designer Meghan Schultz for our card entitled Virgin and Child. A deep blue border highlights the beautiful and serene colors in the original art, where Mary gazes at this precious son that God has given her. The words of Isaiah 9:6 on the cover and inside remind us that this newborn child in the manger is, in fact, our “Mighty God, Everlasting Father, Prince of Peace.” Visit our Christmas cards page to have a look at the inside. Our second new card for 2018, King of Kings, features artwork from the Imperial Cathedral of Speyer, Germany. This Nazarene-style fresco was painted in the cathedral’s interior walls in the mid-1800s by Johann von Schraudolph at the behest of King Ludwig I of Bavaria. The city of Speyer is significant in Reformation history; adherents of the Reformation were first called Protestants when they protested the Holy Roman Empire’s ban against Martin Luther and his teachings at an Imperial Diet in Speyer in 1529.